The Island of Dr. Simbeau Lives! Where does everyone in the NFL rank based only on Week 16? Plus, let's sort through this playoff probability mess. Week 16 was no week of half-measures. Nobody eked its way over the finish line or quietly collected a paycheck. We got to see some teams and players infuriatingly reaffirming what we thought we knew about them while others laughed in our dumb faces for ever doubting them. There were 10 games with playoff implications and nine of them had something important to take away from the contest. (Sorry, Chargers-Raiders.) Put it this way: The league MVP set a meaningful record in what might be the greatest season a quarterback has ever had in the NFL and it was basically an afterthought when it happened. It was a fun week. Of course, with a week to go in the 2013 NFL season, a lot of what happened in Week 16 is going to be put in context and given meaning by what happens in Week 17. I don’t know about you, but I don’t plan on waiting that long. I went through every team, player, coach, and referee from Week 161 and ranked them all based on how they fared during the season’s penultimate weekend. Here are a selection of those rankings and what happened to the league’s most notable and interesting members Sunday. 1,737. The Detroit Lions: As unfairly denigrated players around the league were showing up lazy narratives by producing fourth-quarter comebacks, the Lions went out of their way to reinforce theirs with one of the most typically Lions showings imaginable. Matched up against a Giants team that refuses to win most weeks, Detroit managed to show them the light. The Lions had an 87 percent chance of winning the game with possession of the football and a seven-point lead with 5:38 to go. And then Matthew Stafford threw a tipped pick-six — the 14th of his young career — to Will Hill, who made it into the lineup despite being arrested on Friday on a warrant related to child support payments. From that point forward, even though the Giants turned the ball over twice, the Lions ran 11 plays that produced a net 21 yards of offense. The Giants comfortably converted a third-and-9 and a fourth-and-7 on their final drive to set up a Josh Brown overtime field goal that knocked the Lions out of playoff contention. That sure is a shame, considering that the Bears and Packers both lost Sunday, which would have given Detroit the NFC North title with a win over Minnesota next week. Then again, who exactly were the Lions going to beat? They’ve now lost five of their last six games, with just one of those losses coming against a team with a good shot at making the playoffs (Philadelphia). Calvin Johnson was hobbled for most of the day, and after Reggie Bush fumbled, the Lions benched him for most of the second half. That left Joique Bell and Kris Durham as Stafford’s top weapons. The team failed to recognize that tight end Dorin Dickerson was concussed and let him play through the second half and the beginning of overtime, during which he dropped a pass and committed a holding penalty. It ran a meaningless end-of-regulation draw with 20 seconds left despite its many fumble issues. Oh, and Jim Schwartz was captured on video cursing at booing fans, a charge he denies. Last year’s numbers suggested that the Lions were a 4-12 team playing like a 7-9 team. This year, they’ve played like the 7-9 team. Good riddance. 813. Mike Tomlin: The Tuesday TYFNC column often goes through different probabilities and lays out why one move is likely better than another, even if the relative likelihood of something relevant happening is pretty slim. Occasionally, it’s good to have a reminder of how that actually comes into play. Enter Tomlin’s Steelers, who battled through an up-and-down affair with the Packers before being handed a gift. A Nick Perry encroachment penalty on a Pittsburgh field goal try from the 10-yard line gave Pittsburgh a new set of downs on Green Bay’s 5-yard line with 90 seconds to go. Green Bay could stop the clock once, but the Steelers didn’t need to run another play; they could kneel three times and kick a game-winning 23-yard field goal with no more than a few seconds left on the clock. Instead, perhaps because the Steelers had blocked a 23-yard Packers field goal try earlier in the game, Tomlin decided to try to score a touchdown. Le’Veon Bell got the ball to the 1-yard line on the first play, forcing the Packers to use their final timeout (and ensuring that the Steelers could attempt what amounted to an extra point to win the game), but when Tomlin’s team actually ran the ball again on second down, the Packers let Bell score with 1:28 to go. That put the Packers down seven, but it gave them a chance to possess the ball again. Sure enough, Micah Hyde returned the ensuing kickoff 70 yards, the Packers drove the ball down to the 1-yard line, and only some clock mismanagement of their own prevented the Packers from having multiple chances to tie the game. There are coaching decisions that require more nuance and contextual analysis than strictly appealing to common sense. This is not one of them. A mediocre Madden player would have figured this one out. Tomlin weighed the odds of missing an extra point versus the odds of allowing a team with 85 seconds left to score a tying touchdown before having a shot at winning in overtime and chose wrong. Horrifically wrong. Since 1999, just 1.2 percent of extra points have failed to go through the uprights. There’s no way the Packers’ chances of scoring on that ensuing drive were at 2.4 percent (given that they would likely tie with a score and, to keep things simple, have a 50 percent chance of winning in overtime) or lower. Brian Burke estimates that Tomlin would have had to believe the odds of missing the kick were about 10 percent to justify scoring the touchdown. Were this the Eagles-Lions snow game, Tomlin’s call would have made sense. Given the light precipitation in Green Bay, though, he was way off. It turned what was basically a guaranteed win into a nail-biter. Maybe he should be the one banned from playing pool and Ping-Pong. 773. The referees in the Packers-Steelers game: The crew in that game didn’t exactly cover themselves in glory, either, with Carl Cheffers’s group producing a number of odd decisions. Most notable among them was the series of decisions Cheffers made in regard to the aforementioned blocked field goal. If you watch the play, you’ll see that the blocked field goal was almost surely possessed by Steelers safety Ryan Clark, who had his knee down before he attempted an incredibly shortsighted lateral to William Gay. Gay couldn’t handle the lateral, and with the ball bouncing around, Steelers lineman Ziggy Hood clearly batted the ball out of bounds to prevent Green Bay from recovering it. Cheffers’s crew deliberated for minutes before ruling that the Steelers had never possessed the football and then batted it out of bounds, which gave the Packers an automatic first down. Because the play wasn’t ruled as a turnover, it wasn’t automatically reviewable, and because possession of the ball in the field of play isn’t reviewable,2 the Steelers had no recourse. Then, at the end of the game, Cheffers’s crew likely prevented the Packers from getting an extra play off in their attempt to tie the contest. With the Packers driving and the clock running, Green Bay lined up for a snap at the 1-yard line, only for lineman Don Barclay to commit a false start with 23 seconds remaining, right as the ball was snapped. The officials whistled for the infraction immediately thereafter, but the clock still ran as the players carried the play out, moving the clock down to 20 seconds. Cheffers called for a false start and rightly penalized the Packers both the five yards and a 10-second runoff before starting the clock again with the next whistle. However, although three seconds had run off the clock after the whistles had been blown, that time was not restored. That could very well have been the time needed for the Packers to get one final pass into the end zone. 640. Taking the points: Yet another bad week for being conservative for tradition’s sake! There were two key spots Sunday when a two-point conversion decision saw process match outcome, both good and bad. First, Washington couldn’t be bothered to take a hint. After gashing the Cowboys on a seven-play drive in the third quarter that saw Alfred Morris run five times for 28 yards, a Morris touchdown run gave Washington a 19-14 lead with 19 minutes to go. With an effective running game and the clear benefit of going up a touchdown, it was pretty easy to make a case that Washington should have attempted a two-point conversion. The numbers suggest it’s a no-brainer: Footballcommentary.com justifies a two-point conversion with a five-point lead and 19 minutes to go if you think you can succeed 27 percent of the time. Robert Griffin could have hobbled in on crutches and scored 27 percent of the time from two yards out against the Cowboys. Instead, Washington kicked the extra point and went up six. That seemed smart when it kicked a field goal to go up nine at the beginning of the fourth quarter, but the Cowboys came back with a field goal and then a touchdown of their own. Had it gone for two and failed, Washington still would have lost. Had it succeeded, though, Dallas’s extra point would have merely tied the game. Instead, it gave the Cowboys the win. Meanwhile, a rare moment of promise for the Lions saw them extend the game with a two-pointer in a similar situation. Detroit went up 18-13 with 12 minutes to go and decided to go for two, getting it on a throw to Joseph Fauria to go up 20-13 on the Giants. When Hill picked up his pick-six seven minutes later, the Lions were tied, not trailing. (They would have been trailing had they kicked the extra point or missed the two-point conversion.) It was enough to get the game into overtime. Of course, Mike Shanahan and Schwartz can’t know that the game will come down to those extra points when they make their decisions. Analyzing all the different possibilities of where a game can go from that moment and the likelihood of each score possibility coming into play is almost impossible; it’s better work for a computer than a human. And, sure enough, given that range of possibilities, it’s almost always a better idea to try for two points up five in the second half than it is to kick the extra point and retain a six-point lead. On Sunday, the outcomes just matched up with that process. 559. The grass in Washington: The FedExField grass came under criticism last year after the Washington-Seattle wild-card game in which Chris Clemons and Griffin each suffered serious knee injuries. Washington responded by replacing the surface with a new grass field, which it re-sodded in November to quell concerns that the field would fall apart by season’s end. It went about as well as most things go for that franchise these days. The grass was a mess Sunday, and it hurt Washington’s chances. For one, when Washington center Will Montgomery was called for an illegal snap, I’m almost positive he failed to get the ball out to Kirk Cousins on time because it got stuck in the muck. I can’t prove it, but I swear I saw it. Then, on the game’s final drive, Tony Romo extended a play and produced a huge pass to Terrance Williams for 51 yards when Josh Wilson slipped and slid on chewed-up grass near the sideline. Did the Rams get a groundskeeper in the RG3 trade? 366. The Miami Dolphins: After coming up with an enormous, season-defining win against the Patriots at home last week, the Dolphins had a legitimate shot at the AFC East title while controlling their own playoff destiny. All they needed were two wins against the dregs of the AFC East to clinch a playoff spot. So far, they’re 0-for-1. The Dolphins were ignominiously shut out by the Bills in Buffalo, 19-0, dealing a blow to their playoff chances. It’s not just that the Dolphins lost; it’s how they lost. Specifically, they couldn’t keep Ryan Tannehill upright. Playing against a team that has quietly accrued the most sacks in football this season, a patchwork Dolphins line that was subpar before Jonathan Martin and Richie Incognito infamously left the lineup couldn’t keep the Bills off their young quarterback. Tannehill left the game in the fourth quarter with a knee injury before returning (and leaving again), as the Bills sacked Miami’s quarterbacks seven times and knocked them down 10 times while hurrying them on nearly every passing play. Miami had just one drive with more than one first down and produced eight three-and-outs on 13 possessions. 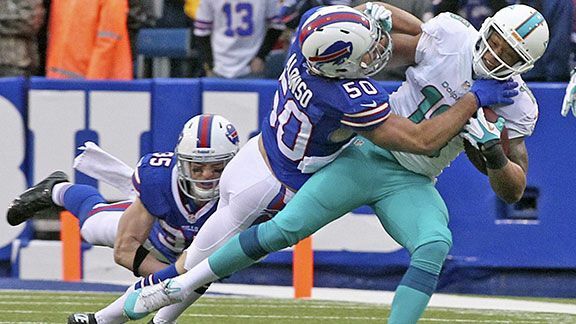 The Bills have a supremely underrated defense, but the Dolphins averaged two yards per play. Two. That’s like making your whole offense out of Trent Richardson. Maybe it was one bad day. You know what, though? The Dolphins aren’t about to get any better at protecting Tannehill. What happens if they have to face Robert Mathis in the first round of the playoffs? What if they end up in a matchup against the Chiefs? Given that the Dolphins ran the ball 12 times for 14 yards, this was probably the worst performance by an offensive line all season. The only good news is that the Ravens also lost, so Miami still has a good shot at making the postseason. But more on that later. 134. Sean Payton: Outside of perhaps Bill Belichick, Payton is the most daring in-game coach in football. It’s not a coincidence they both enjoy airtight job security; if anything, it frees Payton to try an unexpected onside kick and a weird pass play out of a field goal with Luke McCown, knowing he can do whatever he thinks will work best for the team. Daring can be really valuable sometimes; other times, it can backfire or even be the wrong process to begin with. Sunday was a mixed bag for Payton, although I probably have different items in each bag than most. On the positive side of the ledger, I liked the fake-ish field goal more than most. Down 7-6 in the third quarter and facing a fourth-and-12 on the Carolina 34 in humid conditions with a new kicker, Payton sent out his field goal unit and then motioned everyone out while keeping backup quarterback McCown under center. McCown took the snap and overthrew a fade for an incomplete pass that would have been nullified by offensive holding anyway. Bad execution? You bet. Bad play call? I’m not so sure. By running the play out of a field goal set, Payton was able to get better matchups than he would have out of a traditional play. Crucially, he got Jimmy Graham a one-on-one matchup against a cornerback, which is where McCown obviously threw the football. Had McCown’s throw been on line (and had holding not occurred), that would have been a successful play. With Drew Brees in there for a traditional pass play, the throw would have been way more accurate, wherever it went, but Graham wouldn’t have seen single coverage. I don’t know that it was the right call, but it was defensible. Payton was also criticized for going conservative at the end of the game, but I can’t fault him for doing so. Remember: Payton took flak for throwing the ball at the end of the Patriots game, too; at some point, he has to be right about one of those choices. He got the ball with 1:57 left, forced Carolina to use its final two timeouts, and punted the ball back to the Panthers with 55 seconds left. He got beat on a great drive by an offense that his team had shut down virtually all game. That will happen. I think Payton made a couple of mistakes, but they aren’t quite as obvious. Although it worked, I actually don’t think the unexpected onside kick decision made a lot of contextual sense. As I’ve mentioned in the past, the unexpected onside kick is best used in a high-scoring game in which field position doesn’t matter (limiting the downside) and possession is tantamount (making the upside more valuable). This was the opposite scenario, with field position critical the entire game. The Saints recovered the onside kick and kicked a field goal to go up 6-0, but it just seemed like an odd time to pull it out. I guess it was high-leverage in terms of this being an important game to New Orleans’s season. The weirdest call he made, though, was before the game even started. When the Saints won the opening coin toss, Payton decided to defer his decision to the second half, essentially giving Carolina the football. Normally, I would chalk that decision up to personal preference and not give it a second thought, but this was a game in which deferring didn’t make much sense. Both teams were obviously aware, before the game, that an enormous storm was approaching Charlotte. That storm hadn’t arrived at kickoff and was likely to arrive at some point during the second half. It ended up arriving midway through the third quarter and honestly should have stopped play; it certainly stopped the Saints’ offense and forced Brees into an interception. The storm cleared out by the middle of the fourth quarter, but in a close game, it cost the Saints a possession and flipped field position. Now, the Saints couldn’t have known when the storm would specifically arrive within the second half or just how bad the storm would be beyond what radar suggested. But if you know that a bad storm is brewing and it’s going to arrive in the second half, why would you defer your possession to the second half? Wouldn’t it make more sense to receive the opening kickoff, ensuring that you get the first possession of the game while making it likely that you’ll end up with more possessions in the first half than you do in the second one, when there might very well be a serious storm that slows down your passing attack? It didn’t cost the Saints the game, but it was a suboptimal move for one of the game’s smartest coaches. 45. 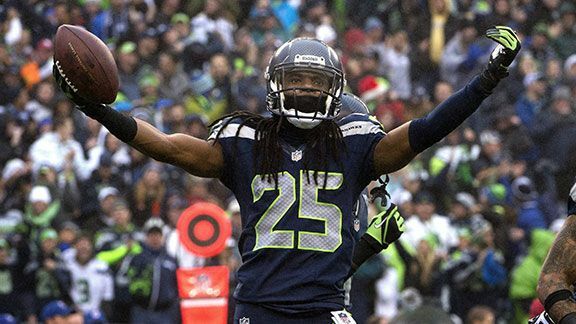 Richard Sherman: Seattle’s star cornerback was all over the place Sunday. Given the primary assignment of stopping Larry Fitzgerald, Sherman was up to the task: He held Fitz to three catches for 18 yards on five targets. He also was responsible for two of Carson Palmer’s four interceptions, both of which came deep in Seattle territory. That brought Sherman up to eight on the year, which puts him in rare company. He also had eight interceptions a year ago, and Sherman is just the fourth player since the merger to have eight or more interceptions in consecutive seasons, and the first player to pull off the feat since Champ Bailey in 2005-06. At the same time, in part for reasons out of his control, it was a bittersweet game for Sherman. He picked up two pass interference penalties for 38 yards, although one was probably a bad call. He furiously insisted that Pete Carroll challenge a would-be fumble and got Carroll to throw the flag, only for Seattle to lose the challenge when the evidence was inconclusive. And then, on Arizona’s final drive, Sherman’s brilliance was for naught. The Cardinals lined up Michael Floyd against Byron Maxwell, the team’s fourth cornerback, who has been moved into the starting lineup with Brandon Browner and Walter Thurmond both suspended. Floyd beat Maxwell on a go route for a game-winning score. Maxwell’s coverage wasn’t bad by any means, but the Cardinals found the weakest spot in the league’s best secondary and exploited it. 16. Bill Belichick: Vince Wilfork. Tommy Kelly. Jerod Mayo. Sebastian Vollmer. Rob Gronkowski. Nate Solder. On Sunday, the Patriots added Devin McCourty and Shane Vereen to their list of injured players and still managed to beat the Ravens, 41-7, in Baltimore. It must have been satisfying in some way after losing twice to the Ravens last year, including that loss in the AFC Championship Game, but even more so that the Patriots did this with a shell of their typical roster. Normally, it’s easy to chalk up this sort of New England win to what Tom Brady does on the field as a Hall of Fame–caliber quarterback, but Brady had a quiet day, going 14-of-26 for 172 yards and a touchdown. No, this was a day to congratulate Belichick, who got contributions out of players nobody else wanted. LeGarrette Blount ran for 76 yards and two touchdowns on 16 carries. Julian Edelman — who couldn’t even get a million dollars on the open market this offseason — had a seven-catch day. Belichick coaxed meaningful reps from the likes of Sealver Siliga and Chris Jones at defensive tackle. He started Michael Hoomanawanui, Matthew Mulligan, Aaron Dobson, Marcus Cannon, and rookie free agent Josh Kline on offense. And those afterthoughts beat the defending Super Bowl champions by 34 points in their house. Good coaches can take yours and beat his; Belichick might just be able to take nobody’s and beat yours. 9. The Indianapolis Colts: Just quietly lurking on the horizon are the Colts, who followed up their best performance in weeks against the Texans in Week 15 with an impressive, sustained run of dominance while beating the Chiefs in Kansas City. Once overrated at points during the season, the Colts might very well now be underrated heading into the playoffs. If they can deliver this sort of consistency on a snap-by-snap and week-to-week basis, they’ll be a much better football team. When I wrote about the Colts’ struggles, I mentioned that the team’s decline had really been precipitated by a drop in their defensive performance, regardless of how easy it was to link the decline to Reggie Wayne’s injury. Well, since then, the defense has gotten things going again. The Colts have allowed just 10 points over the past two weeks, and while one of those games came against the lowly Texans, the Chiefs had been averaging 41.8 points per game over their last four contests. Indianapolis forced Alex Smith to beat them and he simply couldn’t, as the former 49ers starter went 16-of-29 for 153 yards with two interceptions. The Chiefs had five three-and-outs in nine drives before the fourth quarter. The Colts were able to manhandle the Chiefs at the line of scrimmage and force Smith into an endless stream of checkdowns, screens, and short crossing routes, which is fine by Indy. Most interestingly, this might be a game plan they get to pull out again against Kansas City awfully soon. If the Colts remain in fourth seed after this week, they would play the Chiefs again in the first round of the playoffs, this time in Indianapolis. That has to seem like a fun time to the Colts right now. 5. Cam Newton: For the first 59 minutes of the game, Newton was pretty bad. For the final minute, he was a superstar. After a poor game, Newton led an incredible 65-yard drive with 55 seconds left on the clock and without timeouts, culminating in a touchdown pass to Domenik Hixon with 28 seconds left to give Carolina its 17-13 margin of victory. He did all that without Steve Smith, who caught a 44-yard pass in the first quarter before injuring his leg and missing the final three quarters. Newton has now beaten quality teams at home (New England, New Orleans) and even on the road (San Francisco). He has done it without his best receiver and led a two-minute drill against a playoff contender to win the game. None of his teammates seem to be concerned that his smile is fake. You saw all that. Here’s my question: If you insist on knocking Newton at this point, what’s left to criticize? What’s the next thing that will come up? Winning a playoff game? Winning a Super Bowl? That will come. For the moment, though, Newton is content to simply help his team win football games. 4. Arizona’s defense: Seattle, up to this point, had not lost a home game with Russell Wilson at quarterback. It forced Palmer to throw four interceptions, and teams that throw four interceptions in a game win about 5 percent of the time. Had you known in advance that Palmer was going to throw four interceptions, what would you have considered the Cardinals’ chances of winning? I bet you wouldn’t have said 5 percent. Instead, the Cardinals won because their defense outplayed the league’s best unit on its home field. They won by battering Wilson all day with seemingly endless pressure coming up the middle and off the slots from angles that he either wasn’t expecting or couldn’t account for. When Wilson inevitably did Russell Wilson stuff and escaped the pocket, the Cardinals stiffened up and held their coverage long enough for the pass rush to reacquire him in their sights. Arizona sacked him four times, knocked him down nine times, and broke up six of his passes. Wilson finished with 108 yards and an interception, marking one of his worst days as a pro. It’s going to be a shame if Arizona misses the playoffs. It’s about an above-average quarterback and a pair of offensive tackles away from being a really good football team, and when Palmer’s feeling it, it might not even need that. The Cardinals are a fun defense to watch, especially when they have to go shot-for-shot with another star-studded unit. They’ll get one more shot at that this year when they play San Francisco in Week 17. 3. Peyton Manning: Has anyone ever set a quieter major record for a skill-position player? The situation lended itself to a quick highlight: There were games with playoff implications marching downfield at the same time, the Broncos were blowing out a terrible Texans team in front of a half-full Reliant Stadium, and Manning was basically just tossing fade routes to whoever he had on the outside against a dismal Houston secondary. They might as well have handed him the MVP while they were at it, if only to try to get RedZone to stay on the game for an extra 30 seconds or so. Which isn’t to say that Manning’s feat isn’t incredible, of course. He’s going to probably end up with something like 54 passing touchdowns in 16 games, which is the sort of stuff that makes you think you should up the difficulty level in Madden. Not bad for a guy who is trying to sell Buicks to rich people who are past their athletic days. You know, like Peyton Manning. For the team, beating the Texans wasn’t much fun. Von Miller suffered a serious knee injury in the first half and did not return, and while Miller walked off the field, there are rumors he could have an ACL injury. Eric Decker went down briefly with an injury before returning. Even Manning got hit hard by J.J. Watt and appeared to take a nasty shot in the second half. Denver has to play hard and win next week to keep its no. 1-seed, but man, it will sure appreciate the bye week rest. 2. Chip Kelly: The Broncos have the best offense in football; they average 38.2 points per game, which is comfortably ahead of the pack. In second are the Chicago Bears, who have averaged an even 29 points per game, even after their blowout loss last night. If you don’t include the two games when Matt Barkley suited up and played meaningful snaps, well, the Eagles are right there. The Eagles scored 10 points in those two games; otherwise, they’ve averaged 31.4 points per game, which would make them the second-best offense in football. The Broncos have Peyton Manning. The Eagles have Nick Foles. There’s not anything new to say about what Kelly’s doing; it’s the same stuff that Chris Brown suggested before the season, mostly. There’s no gimmick to it. It’s just hyperefficient, and when you’re playing the league’s second-worst run defense, it becomes a deadly weapon. LeSean McCoy could have set the single-game rushing record if Kelly had made that a priority. 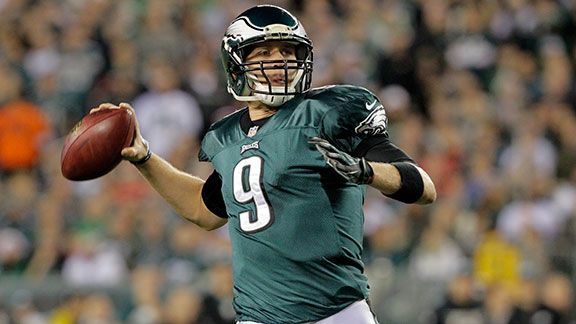 Foles might have been able to do it, too. 1. Tony Romo: It was a brilliant drive from a guy who deserves far more credit than he gets. And, sadly, it’s going to be entirely forgotten if the Cowboys don’t win next week. I wrote about this phenomenon with regard to LeBron James after his famous Game 6 performance against the Celtics. If Romo had a bad game against Washington on Sunday, we would have counted it on his résumé as an unclutch performance when his team needed him. Because he had a good game and came up with a monster drive to win it, though, we write that off and focus on what he has to do next. If he struggles in Week 17, the takeaway from this season will be “Tony Romo blew it again,” not “Tony Romo blew it in a game or two, but then he had an incredible comeback drive to win a key game in Week 16 before struggling in Week 17.” Once the mark is on you, man, it’s hard to get it off. The Cowboys, by the way, ran the ball 14 times for 36 yards in the second half. They won in spite of their running game, not because of it. Can we throw that stat and perceived weakness away now? Thanks. With 17 games left to go in the 2013 regular season, just one of the 12 teams that will eventually make it to the NFL playoffs knows where it will be seeded. The 11-4 Kansas City Chiefs are locked into the fifth seed in the AFC. Beyond that, everything is still up for grabs. Just seven teams have clinched playoff berths, with a mere two teams in the NFC assured of playing football next month. The Saints could still have the first week of January off because they’re the 2-seed … or have it off because they’ve missed the playoffs. The Steelers could still make the playoffs! Maybe the Lions could still sneak in with a well-written essay and a few letters of recommendation. The possibilities seem endless. They’re not, but it’s close. There’s no win-and-in scenario for the final spot in the AFC playoffs; each of the four candidates needs to win and get at least one other game to go their way to make it in. The NFC has two win-or-go-home games on the docket in Dallas-Philadelphia and Chicago–Green Bay, but where those teams end up in the seedings and where the rest of the spots in that conference go remain up in the air. You can find a full list of all the different playoff-clinching scenarios for each team here. But given that there’s one week left and there are so many different possibilities still available, I thought it made more sense to try to figure out what each team’s odds are of ending up with a given spot in the playoffs. With that in mind, I generated expected winning percentages for each team using its points total and the log5 method to find the probability of each team winning each Week 17 matchup with playoff implications. There were a couple of exceptions I had to account for. I assumed the 49ers will beat the Falcons on Monday night, although I kept their points scored and points allowed totals as currently listed. I used the Packers’ current points scored and allowed as a fair measure of their current ability because that already incorporates a mix of games in which Aaron Rodgers was the starting quarterback and those in which his backups started, and since we don’t know whether Rodgers will start Sunday, that seemed fair. Finally, since the Chiefs don’t have anything to play for and will likely rest some of their players, it seems inaccurate to use their season-long totals as the quality of their play. I estimated them to be a .500-caliber team for Sunday.3 Then, with all those probabilities, I built a Monte Carlo simulator and ran the final week of the season 10,000 times to estimate each team’s final resting place this time next week. Miami’s disappointing loss in Buffalo cost it a shot at the AFC East title and prevented the Dolphins from controlling their own destiny, but their odds of making it into the playoffs are still very good. They have, by far, the best matchup among the four teams left competing for this playoff spot: The Dolphins host the Jets, whose 7-8 record masks a gruesome point differential that suggests they’re really a 4.5-win team. In addition, Miami has the clearest path to a playoff spot: It only needs to win and have either the Ravens lose or Chargers win. It also makes it if each of the four contenders lose. Their primary opponent for that spot, the Ravens, lost their best shot at making the playoffs by getting blown out at home by the Patriots. (What home-field advantage?) Now, they have to travel to Cincinnati to play the Bengals, who still need to win in Week 17 to ensure that they keep the 3-seed and get to avoid the Chiefs in the first round (and the top seed in the second round, were they to win in Round 1). And then, even if it gets past the playoff-caliber competition in Week 17, Baltimore makes it only if Miami or San Diego lose. The other two contenders need multiple results to go their way. The Chargers need to win at home against Kansas City and have the Dolphins and Ravens both lose. And if the Chargers, Dolphins, and Ravens all lose while the Steelers win at home against Cleveland, Pittsburgh wins a five-way tie at 8-84 and miraculously earns itself a playoff nod. By virtue of its easy opposition and shorter path, Miami is the comfortable favorite to claim the sixth and final spot in the AFC. Again, just as was the case with the Dolphins, Seattle’s surprising loss is mitigated by the fact that it’s still in a favorable position. Their spell of home dominance might have been broken by Arizona’s upset victory, but the Seahawks can still clinch the top seed in the NFC with a victory in Week 17 at home against the Rams. St. Louis has won its last two games, but it’s now going to be without left tackle Jake Long, who is believed to have a torn ACL. Seattle will be heavy favorites to win its game, but even if it were to lose, it would still be the top seed if San Francisco lost either of its two remaining games. The 49ers have a more difficult path to the top spot. They would need to win out (with one of those wins already reflected in the odds above) and have both the Seahawks and Panthers lose in Week 17. If the Seahawks lose and the Panthers win, though, Carolina would claim the top spot by virtue of its win over the 49ers earlier this year. That would leave the 49ers as the 2-seed. The Saints can sneak into the top two only with a win and a Panthers loss. New Orleans hosts Tampa on Sunday, while Carolina travels to Atlanta and San Francisco travels to the unfriendly confines of Arizona. For all its hard work against the Seahawks, Arizona’s chances of making its way into the playoffs are still very slim. At 10-5, the Cardinals need help to make their way in. They will need to beat the 49ers at home and then hope that the Buccaneers beat the Saints in New Orleans, which would leave Arizona one game ahead of New Orleans for the sixth seed. If the two teams have the same record, New Orleans’s 31-7 victory over Arizona earlier this year wins it the tiebreaker. The Cardinals will also lose any tiebreaker with the 49ers, which is why Arizona would be locked into the sixth seed even if things go its way. The Cardinals could also make the playoffs in a scenario unreflected above: They would need the 49ers to lose to the Falcons in Week 16 before beating the Niners in Week 17. The Saints would be the sixth seed with a 49ers win, the fifth seed with a win and a Cardinals win, and the second seed with a win and a Panthers loss. Seeding in the middle of the pack, thankfully, is far simpler. If the Eagles win, they’re the 3-seed and the NFC North champ is the 4-seed. If the Packers win, they’re the 4-seed and the NFC East champ is the 3-seed. If the Bears win, they need a Cowboys victory for Chicago to clinch the 3-seed. Likewise, if the Cowboys win, their path to the 3-seed requires the Packers to win. You can’t prove that isn’t true. This was news to Tomlin, Kevin Harlan, and Solomon Wilcots. A more accurate estimate of each team’s respective win percentage for Week 17 would be the Vegas moneyline for each side; those weren’t available to me while writing this, but I’ll rerun the numbers with those percentages as part of Tuesday’s post on the Triangle. Which includes the Jets, who can knock the Dolphins out of contention but can’t win that five-way tiebreaker, because the NFL first resolves ties within divisions for multiway wild-card tiebreakers. Whee!